Use Mannington t-molding transition strips for 1/4" to lesser thickness of flooring. Order this rubber t-molding in 12' sections, no need to buy full cases. Mannington t-molding transition strips can be easily cut to the needed size. The 12' sections of rubber t-molding will be shipped coil. Once received, just uncoil and lay flat for easy installation later. 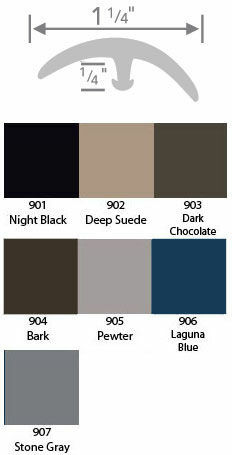 You will find this rubber t-molding in 7 of the most popular colors; black, blue, browns, and grays. Sample colors are given at the bottom of this page. Actual color of t-molding transition strips may vary slightly due to computer screen settings. Contact us if you need further information regarding color. T-molding transition strips have the approval of the American Disabilities Act (ADA). The rubber t-molding will provide you a smooth, firm transition. Requires the use of track base. T-molding transition strips will fit snug and bridge various types of flooring. 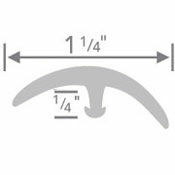 When ordering t-molding transition strips a quantity of 1 means you will receive a 12' section. Order your rubber t-molding in as many 12' sections as needed.